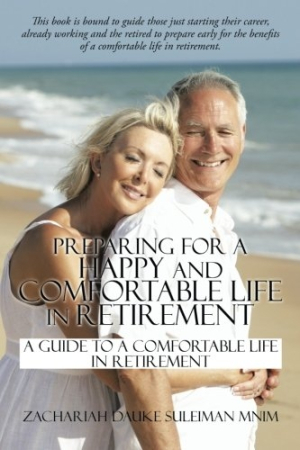 This is an enthusiastic and passionate book of advice on planning for retirement. As people live longer, the “retirement” book category grows to meet them. Zachariah Dauke Suleiman’s Preparing for a Happy and Comfortable Life in Retirement offers some solid commonsense counsel within the genre, though its material is not entirely surprising. Unlike some retirement books, this volume does not offer steps to take in developing a retirement plan. Rather, it approaches the topic of retirement more generally, even including material that focuses on preretirement years. This less typical approach may be due to the fact that Suleiman, who works in the Nigerian oil and gas industry, is not a retirement expert. The text addresses three different audiences, including individuals who are just starting out in the workforce, those who are currently employed, and retirees. Its advice for these groups is predictable and sound: plan early for retirement; focus on a passion in retirement; be prepared for a different kind of life. The volume does not, though, include a high level of detail or specific actions to follow. As such, this book may prove most useful to a younger audience, who may learn about the basics of retirement; it is less suited to those close to retirement. Chapters regarding money and investments are more pertinent and instructive. They detail different ways of acquiring money and fundamental means of handling that money, including saving and investing. Suleiman also covers specific aspects of investing and investment vehicles, such as stocks, real estate, and “investing in your own business,” a particularly helpful section that offers a solid overview of what it takes to start a business. The last part of the text concerns success, setbacks, and “the comfort zone” in chapters that are more conceptual and motivational than the work before them. They feature an interesting take on the phases of success, good advice about how to manage setbacks, and a lucid discussion of why it is important to go outside one’s comfort zone. “Outside the comfort zone,” writes Suleiman, “lie the opportunities, the threats, and risks that are required to make progress in life.” These sections are well written and nicely delivered but almost feel as though they should be part of a different book, one that is broader than the subject of retirement alone and concentrates instead on personal development. Despite some shortcomings, Zachariah Dauke Suleiman’s Preparing for a Comfortable and Happy Life in Retirement is an enthusiastic and passionate, if not entirely fresh, volume on planning for retirement and taking the necessary steps to secure one’s financial future.